This Chinese 5-Spice Chicken Stir-Fry with Vegetables is the quickest and easiest way to get a nutritious meal on the table in under 30 minutes. 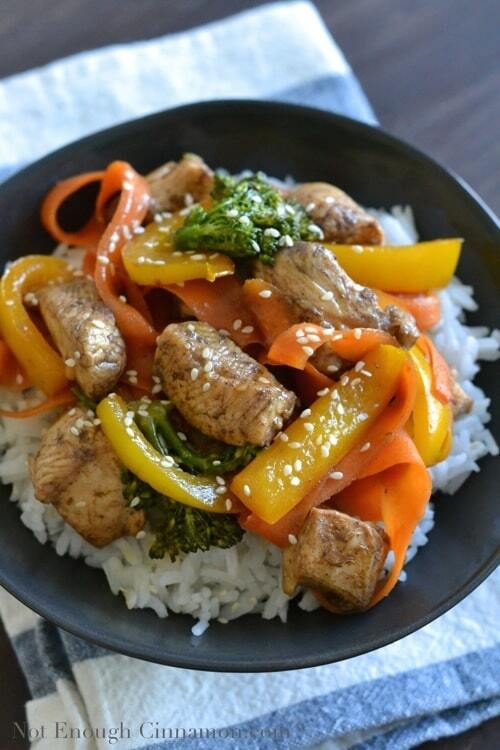 My homemade chicken stir-fry sauce makes this a healthy alternative to Chinese Take-Out! I’ve never really written down a bucket list, but if I had, you would see “food travelling” on top of it. Food traveling as in I’m visiting a country/region with the primary purpose of stuffing my face with local specialties for breakfast, morning snack, pre-lunch snack, lunch and so on until I can no longer walk. Ok, I’m kidding. Just a little. Southeast Asia is one of the food destination I’m most excited about. Vietnamese cuisine being my number one favorite of all. We’ve been slightly traumatized by our disastrous trip back to Australia with Vietnam Airlines a few weeks ago but I’m trying very hard to get this first bad impression out of my head because I really really want to like this country. Because I already love their pho, banh mi and bun bo. So Vietnamese is my favorite cuisine but really any Asian cuisine will do. The inspiration for this 5-spice chicken recipe came from a documentary we watched with Solal’s parents on our trip to the Basque Country. A famous cook was travelling throughout China and tasted local specialties. All of them looked amazing but what particularly caught my attention was a 5-spice pork recipe. We were all salivating just by looking at the screen. I’m sure today’s recipe for 5-Spice-Chicken is very different from what we saw that night but it might be just as good! Instead of pork I opted for chicken that I tossed with Chinese 5-spice powder. Now you might ask: Marie, what is 5-Spice Powder? Well, 5-spice is a mix of star anise, cloves, cinnamon, black pepper and fennel seeds. You can find some at most grocery stores and it gives a very unique flavor to any dish you’re making. What I love most about this easy Chinese 5-Spice Chicken is the homemade chicken stir-fry sauce. It’s thick, sweet and salty at the same time. 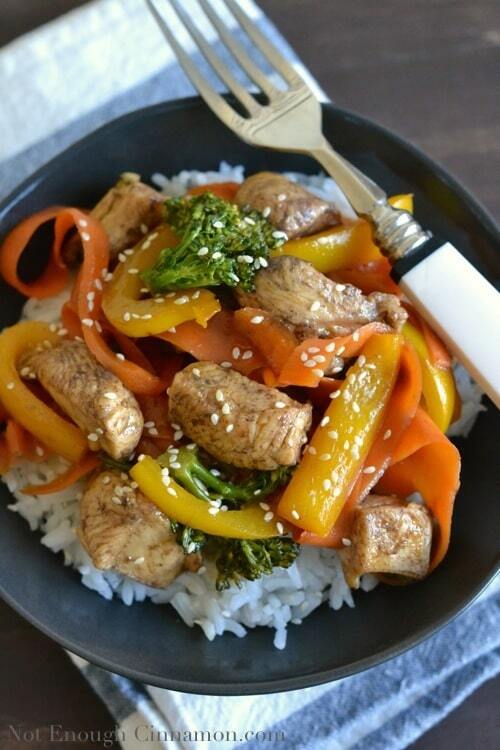 This healthy chicken stir-fry sacue is the perfect companion to the spicy 5-Spice Chicken. I served this healthy chicken stir-fry over Jasmine rice for Solal and had mine without as a low-carb dinner. Cauliflower rice would also work great as a healthy side. You decide what works best for you and your appetite / diet ! If you tried this Chinese 5-Spice Chicken, don’t forget to rate the recipe below and let me know how it went in the comments – I love hearing from you! You can also follow me on Instagram, Pinterest and Facebook for more deliciousness and behind-the-scenes! 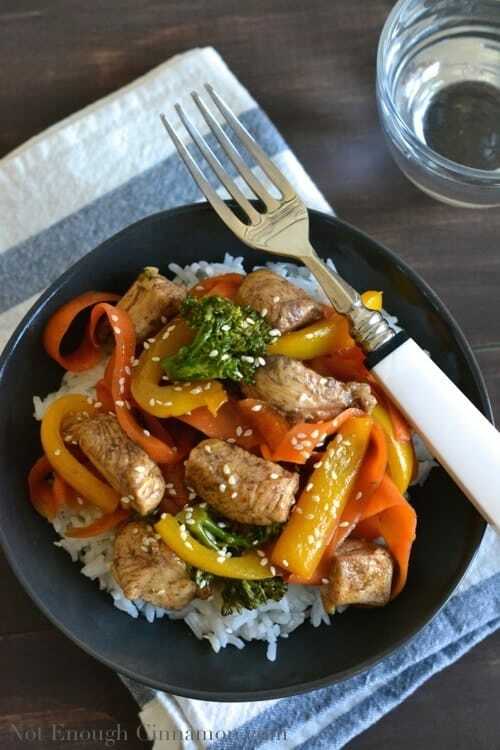 This Chinese 5-Spice Chicken Stir-Fry with Vegetables is the quickest and easiest way to get a nutritious meal on the table in under 30 minutes. My homemade chicken stir-fry sauce makes this a healthy alternative to Chinese Take-Out dinners! Add chicken, five-spice and salt in a bowl. Using a spoon or your hands, combine to coat chicken with spices. Cut bell peppers into strips, then cut these strips in half. Make carrot ribbons using a vegetable peeler and cut broccolini into smaller florets. In a medium bowl, whisk together sauce ingredients. Once everything is ready, heat 2 teaspoons olive oil in a large non-stick skillet over high heat. When oil is hot, add chicken and cook for 5-6 minutes or until chicken is almost cooked. Remove from skillet. Add another 2 teaspoons of olive oil. Add veggies and stir fry for about 2 minutes. They should still be crispy, so pay attention not to overcook them. Put chicken back into the skillet and add sauce. Cook for 1 minute, stirring. Serve immediately with jasmine rice and sprinkle with sesame seeds. * Five-spice powder can be found in most grocery stores. It's a mix of star anise, cloves, cinnamon, black pepper and fennel seeds. ** If you want to eat this with rice, start heating the cooking water just before prepping the ingredients so that rice and chicken are ready at the same time. Yum! This sounds simply wonderful. I have 5-Spice in my cupboard screaming my name–love this recipe. Can’t wait to try it out! I finally got around to making this and it was a hit for both of us. I served it over stir-fried cauliflower rice, which turned out to be a great idea because it allowed us to have beer with our dinner. 🙂 The one we had was 61 by Dogfish Head, which is an IPA brewed with Syrah grape must (it’s not as bitter as your usual IPA). Perfect accompaniment. Thanks for another great recipe. Oh wow! This is really delicious! I enjoy the complexity of five spice. Thanks for the inspiration. An excellent, warming dish for a cold Canadian night! There is perfect recipe of spice chicken to see. Thanks for sharing it! I am a huge fan of homemade healthy stir-fries and I actually even have a 5-Spice mix in my pantry! Will definitely try this one! Olive Oil should not be used for high heat cooking. Other than that, it is a good recipe with good results. Feel free to use your favorite oil Ricky. Thanks for your feedback!